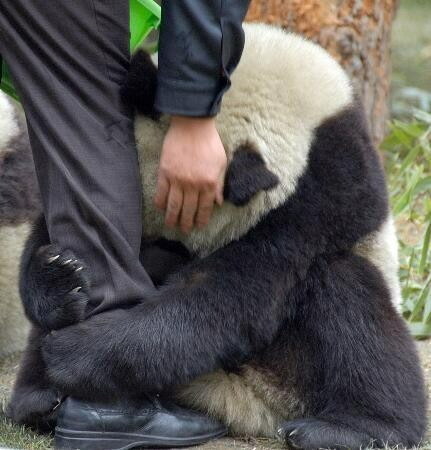 Frightened Panda clings to Policeman's leg after the Earthquake in Japan. This photo, which I originally published here, is challenged. It’s not a fake, exactly; the image is real, but it’s five years old, and was taken at a panda research center, and not in Japan but in China, and the guy isn’t a policeman, he’s a keeper, and it was feeding time, and the panda wasn’t terrified but hungry. Thanks to those who got in touch about this.